The Brazilian investment promotion initiative just published a thought-provoking study about common clauses in contracts between investors and Brazilian startups. It seems to me that Brazilian startups are still a bit naive. Those are rookie numbers. What to expect in a typical investment contract? 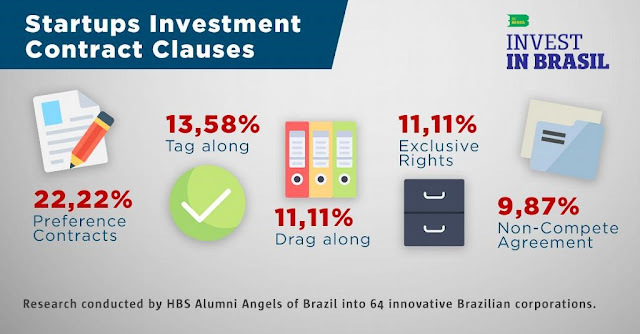 Research conducted by HBS Alumni Angels of Brazil into 64 innovative Brazilian corporations shows the most common clauses used in investment contracts between investors and startups. Invest in Brasil is the brand that identifies the investment promotion initiatives of Apex-Brasil - the Brazilian Trade and Investment Promotion Agency -, whose mission is to develop the competitiveness of Brazilian companies, promoting the internationalization of their operations and the attraction of foreign direct investment (FDI).